When Meredith hit the finish line at the Niagara Falls Marathon last year, people in their living rooms all across America choked up. Who could help it? Here was a young woman who, just a few months earlier, had weighed in at 340 pounds on the hit ABC show Extreme Weight Loss. Now for all the world to see—and merely part way into her one-year effort to pare down—she’d (literally) gone further than she’d ever expected. From barely being able to walk up the stairs to running 26.2 miles in practically no time? The body is an amazing thing. And yet … it’s no match for the brain. It wasn’t the strength of Meredith’s body propelling her across the Niagara Falls finish line—it was the power of her mind. No one knows that better than JD Roth, who as the number one producer of TV weight loss shows has helped countless overweight people change their bodies—and lives—for the better. Viewers of Extreme Weight Loss, The Biggest Loser, The Revolution and other transformational shows have seen the “technicians”—the trainers, the nutritionists, the doctors, and other health pros who appear on-screen—but they’ve never seen the heart and soul behind these amazing makeovers. That would be JD, whose production company not only created weight loss television, but who has produced more episodes in the genre than all other producers combined. He’s the behind-the-scenes wizard who gets inside the heads of the shows’ participants, encouraging, persuading, prodding, and inspiring them to succeed. Intimately involved in casting the shows’ contestants, then seeing them through the weight loss process, he’s the guy whose picture they tape onto their elliptical trainers and angrily scream at each night—then hug out of gratitude the next morning. He’s the guy who holds them when they cry and the one who tells them they need to get back on the treadmill even though they’re crying. JD is the shows’ tough-love dad—love being the operative word. Because it’s not just TV to JD; he’s on a mission to change people’s lives. Every fat person (yes, “fat person”—there’ll be no sugarcoating here) knows that you need to move more and eat less to shed pounds. Not exactly rocket science. Yet that simple formula doesn’t get to the root of what makes someone top out at 500 pounds, or sometimes just carry an extra fifty. The missing link in transformative weight loss is mental and emotional fortitude. Mining the same problem-solving and motivational skills JD has used so successfully with reality show contestants, The Big Fat Truth gets readers to address the real reasons they’re overweight (and nobody gets away with saying it’s because they love food). With his combination of enthusiasm, empathy, no-holds-barred style, and master story-telling abilities, JD helps them unearth and tackle the unresolved issues they’ve buried under the French fries and chocolate chip cookie. Presented in three parts, The Big Fat Truth includes short straight-to-the-point chapters that help readers identify their real issues, create their own reality show, and then shake up their lives to do the impossible. Included throughout are inspiring stories, advice, and before-and-after photos from people JD has helped to lose weight (both on camera and off), along with quick tips for how to stay accountable and a 30-day plan for putting this advice into action. "JD Roth will cheer louder for you, fight harder for you and believe more in you than you may even do for yourself. He has become a guardian angel to so many people around the globe who struggle with their weight. I devoured his book, The Big Fat Truth, faster than my favorite roast turkey sandwich with lettuce mustard and tomato on Ezekiel bread. And, if you are like me, while reading his book you will feel his inspiration, devotion, commitment and passion to make our bodies less heavy and our hearts more full." 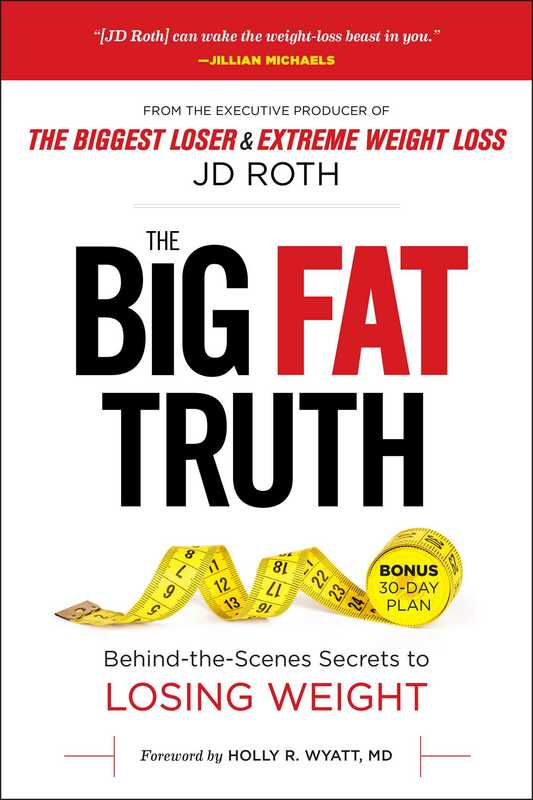 "JD Roth throws out a life line to those who want to lose weight. He's a powerful compassionate ally whose tough love approach will absolutely help you shed extra pounds. The Big Fat Truth is your answer to a healthier, lighter you!"